← Supper menu w/c 4th of January 2011: 1st savvy menu of the new year! As I am writing this review, I have listened to Radio 4 Woman’s Hour on diets and the diet industry with, amongst others, Arabella Weir who has struggled with weight all her life and whose latest book is called “The real me is thin”. From listening to the introduction to the programme, where women recount the many and varied (mad) diets they have tried, it is abundantly clear that although many of us know more about food and nutrition than ever, diets don’t keep the weight off (diets have a 97% failure rate!) and as a nation we are generally becoming fatter. I have also watched Channel 4’s documentary “Britain’s Fattest Man” which looked at Britain’s most desperate cases of overeating and the nation’s rising tide of obesity: at 57 stone, the 49-year-old Paul Mason is the tragic object of tabloid scrutiny, logistical nightmares and extreme medical measures. One thing is for sure, there is no dignity for the super-obese! Of course, it is hard to relate to extremes, but Paul Mason wasn’t born fat. He grew fat, and fatter and fatter still. Dieting is big business: worth £2.6b in the UK alone. We believe fad (read “quick fix”) diets will quickly deliver the desired weight loss and the concept of “healthy eating” has become a muddled term. “Weight management” and “nutrition” are often confused as a diet based on food choices focused on nutritional content can still lead to weight gain. So, if you are among the millions of people for whom day-to-day-dieting is a way of life, what now? Ian Marber, also known as The Food Doctor www.thefooddoctor.com , believes there is another way to eat. One that enables you to manage your weight, promotes energy, reduces hunger and still provides the good nutrition you require. This is what his new book “How not to get Fat: your daily diet”, due out on the 11th of January, is about. I must state here that I have never been keen on The Food Doctor’s ready meals and salads: they lack imagination, look “messy” in their plastic containers and every single meal has been generally sprinkled with mixed seeds. 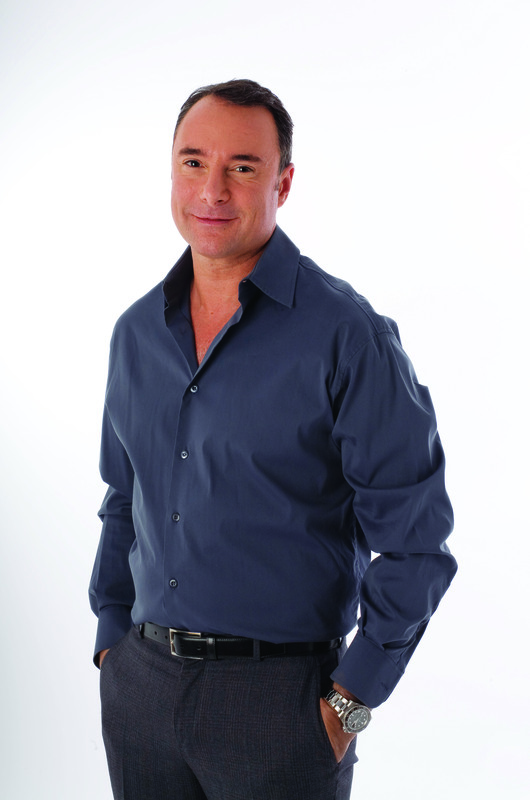 Bit I do rate Ian Marber, MBANT Dip ION, regular contributor to leading magazines and publications, prolific writer, founder and principal consultant at The Food Doctor Clinc and his no-nonsense approach to nutrition. In his latest book, Ian Marber takes us through the basic science of how food becomes energy, in particular glucose management, how much glucose different foods create and their effect on your energy levels and how soon after eating you feel hungry again. This section is excellent: it explains in layman terms how food is turned into fuel by the body’s digestive system. In particular, Ian explains glucose management, which is such a vital aspect of weight management, in detail. In my work with clients at SavvyCook www.savvycook.co.uk and children and parents at SavvyKids www.savvykids.org.uk I am very aware how confused many people are about food and what constitutes appropriate eating. Earlier this year I wrote in this blog about glycemic index and glycemic load in an effort to demystify glucose management and to explain some simple facts about how the human body works as well as offer tactics to manage bloodsugar levels. Ian Marber goes on to apply the understanding of glucose management to knowledge of other food groups, fat and protein. A vital concept in the daily diet is always to eat protein and complex carbohydrates together and to eat every two and a half to three hours, starting every day with breakfast. The book then goes on to provide information on 50 typical healthy foods you might choose to eat, including advice on how to choose, buy, prepare and cook these foods and offers over 200 suggestions on how to turn them into easy but appealing meals and snacks. I was pleased to see a wide range of ingredients described, including some less well-known grains, pulses, different kinds of meat and a wide range of vegetables. More information about provenance and seasonality under “what to look for” would have been welcome, although I appreciate that in the context of this diet these factors are largely irrelevant. The recipes + meal suggestions are imaginative, practical and should be easy to follow by even not very confident cooks. I liked the dry roasted chickpeas with chilli, cumin and cinnamon snack suggestion, curried quinoa and vegetable pilaff with toasted coconut and braised steak with olives, tomatoes and orange zest. Suggestions on batch cooking are included plus ideas on what to do with left-overs. I am no fan of freezing food: domestic freezers are not really equipped to freeze food really fast so no ice crystals are formed in the process. More often than not, the eating quality of a previously frozen meal is compromised as a result. Nuts and seeds play an important role in “the daily diet”. One of the ultimate convenience foods, seeds are an instant way of adding protein, fibre and “good” fats to a dish. I was surprised not to read a recommendation to grind the seeds to make the absorption of the nutrients by the body much easier. In the final section of the book, Ian shares a number of food planners, including his own (! ), based on different ages, circumstances and lifestyles. The food planners aim to show you how easy it is to follow the plan. You simply work out which case study most closely resembles your situation and use the food planner as a blueprint that you can adapt. All in all this book is an excellent addition to the plethora of books on weight management already on the shelves – and perhaps on your shelf if you are among the millions of people who have happened to gain weight and are considering a(nother) diet? I like the fact that the focus is on understanding the science of turning food into fuel, the effect of glucose on your body, energy levels and mood, not calorie counting, and the importance of eating little and often. Naturally, as with anything in life worth having, eating well does take time, thought and effort. 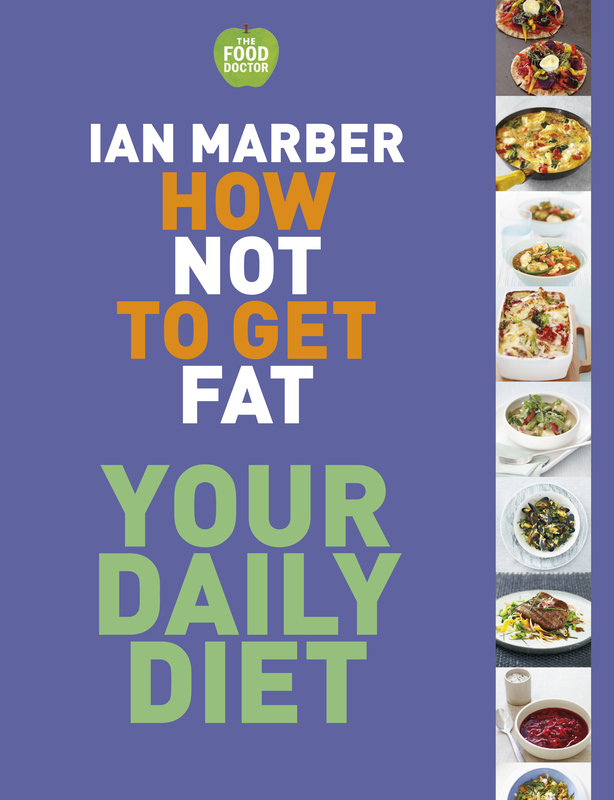 Not having the time to eat well is not an excuse in my, or Ian Marber’s, book! Time, or lack of, is an issue for all of us, but this a question of priorities and eating well does not have to be complicated. I’d like to finish here with a delicious recipe for French leek and onion soup, with the novel addition of a poached egg over which the hot soup is ladled just before eating. Heat the oil in a large, non-stick, saucepan over medium heat. Add the onions and leeks and fry, stirring until they begin to soften and colour, for about 4 minutes. Then reduce the heat as low as possible, cover and cook very gently for 10 minutes. Remove the lid, turn up the heat and fry, stirring, for 3-4 minutes until golden. Stir in the quinoa. Add the stock, the bay leaf and some seasoning. Bring to the boil, reduce the heat, cover, and simmer gently for 20 minutes. Pre-heat the grill. Break the eggs, one at a time, into a cup and slide each into the simmering soup. Simmer for 2-5 minutes, depending on how well-cooked you like your eggs. 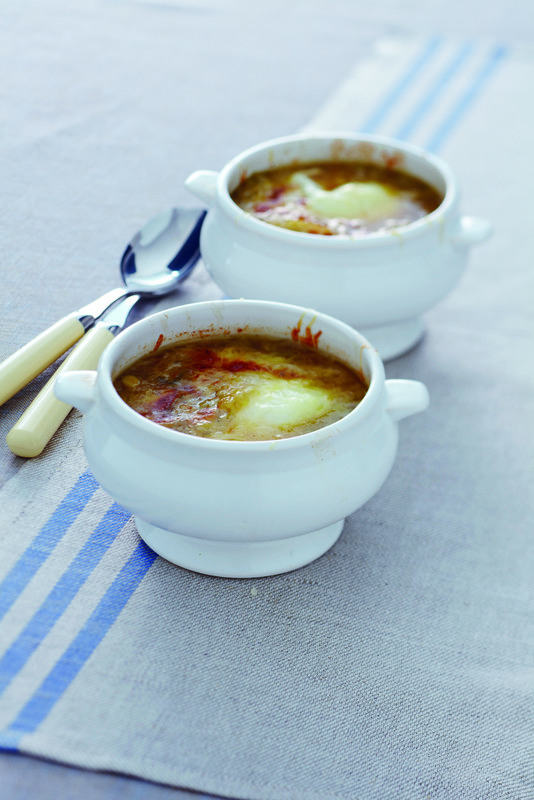 Carefully lift out the eggs with a slotted spoon and place in 4 flame proof soup bowls. Don’t worry if there are bits of egg white left behind. Ladle the soup over. Cover the top of each bowl with the grated cheese and place under the grill until melted and bubbling, about 3 minutes. This entry was posted in bloodsugar balance, book reviews, glucose management, How not to get Fat, Ian Marber, Quadrille and tagged book review, glucose management, How not to get Fat, Ian Marber's new book, Quadrille, your daily diet. Bookmark the permalink. Ga de prei- en ui-soep maken, lijkt me heerlijk! Weer eens iets anders.